With home care packages enabling a growing number of older Australians to stay longer in retirement villages, the need for the royal commission to examine whether the current jumble of state government laws will be appropriate for retirement villages into the future. Retirement Villages Quasi Aged Care - With home care packages retirement villages are becoming quasi aged care. They must be part of the Aged Care Royal Commission as the negative financial impact on retirees living in retirement villages means they can require greater residential aged care funding when the time comes for that higher level of care. Retirees can sell their only major asset the family home and pay an in-going amount to enter a retirement village often commensurate with a purchase cost, but granted only a conditional lease / licence to occupy. They then pay monthly maintenance fees, administration fees, selling costs on departure, a Deferred Management Fee often 35 % to 45% of the in-going amount paid, often they have little or no access to any capital gain, they suffer a devaluation of the refundable amount (the In-going Amount Paid minus the Deferred Management Fee) by CPI in each year of occupancy. All this on a property they do not own but simply have a conditional right to occupy. Vastly more financially punitive than under a standard residential tenancy agreement. The table above shows the financial impact where a retiree stays in the family home or downsizes but maintains financial independence and some financial certainty by retaining property ownership. Their greater capacity to fund or make a contribution to their own residential aged care costs can be dramatic. The table also shows that other retirees can have a reduced capacity to fund their own residential aged care costs and will look to the taxpayer to fund any shortfall. This of course places an ever increasing strain on the commonwealth budget. Retirement Villages are acknowledged as good social environments in which to live but they can come at a huge capital cost to the retiree, increasing their need for greater residential aged care funding from the taxpayer. Federal Laws For Retirement Villages - Another critical matter is whether retirement villages should continue under a jumble of state laws or come under federal law. 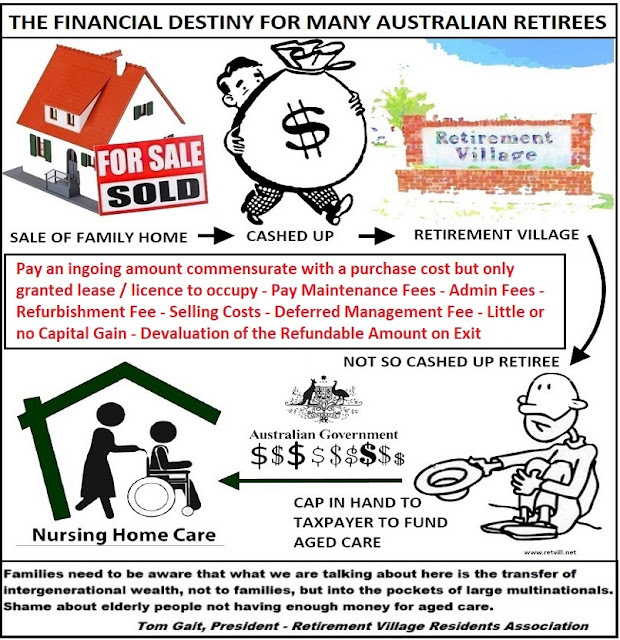 The retirement industry direction for residential Aged Care and Retirement Villages is a closer relationship and where possible a joint facility where the operator is a registered care provider, providing in home care to the residents of the retirement village section through home care packages. This will lead to an increasing number of aged Australians spending a longer period in retirement villages and potentially a shorter period in residential aged care, receiving commonwealth funding for in home care in retirement villages that operate under this jumble of various state government legislation. Their material outlines the many reasons why retirement villages should be under federal laws and well beyond the simple principals expressed here. It is essential the Aged Care Royal Commission look into retirement villages and the need for inclusion under commonwealth laws..
Summary - The record for state government reforms and better protections for residents of retirement villages has not been a good one. Simply maintaining the status quo will confine many older Australians to living in retirement villages as quasi aged care. Seeing them reside under a jumble of state government legislation, subject to increasing reductions in their capital base and generating an ever reducing capacity to contribute to or fund their own residential aged care costs.